A diner tasting this pie on July 4th for the first time remarked, “It’s like Mi-Cuit”…referring to a French dessert that is, in texture, somewhere between a warm cake and a hot pudding, and is the better part of both. (You may find a recipe for it here at the diplomatickitchen.) 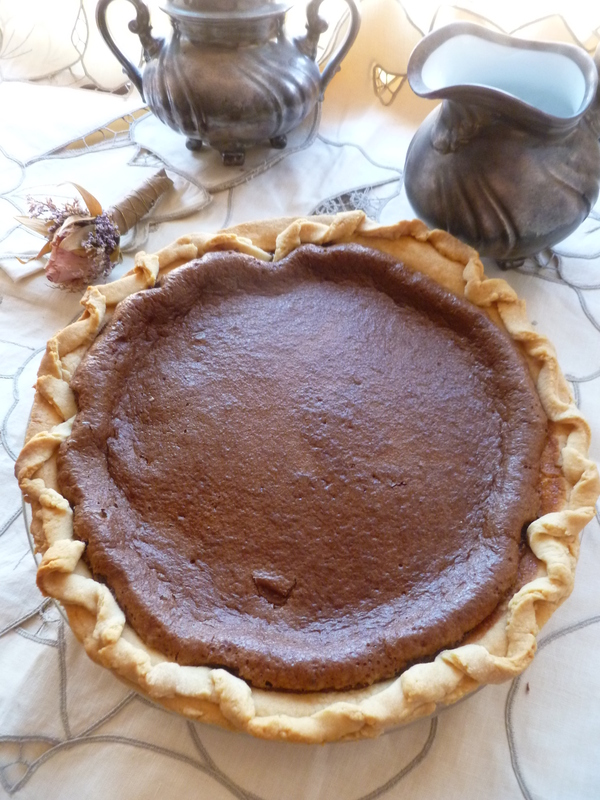 It is not that this American pie, made from an old and very traditional American recipe, is the U.S. equivalent of the French Mi-cuit, but that the pie’s filling hovers between a solid and a thick, rich liquid chocolate, just as it does with Mi-cuit. This pie is served for dessert in the July 4th dinner menu: A July 4th Dinner Under the Desert Sky. A triple-layer frosted cake is certainly very “American”, but for rounding off a dinner American-style, “pie”, as someone once succinctly if not poetically put it, “is the thing”. 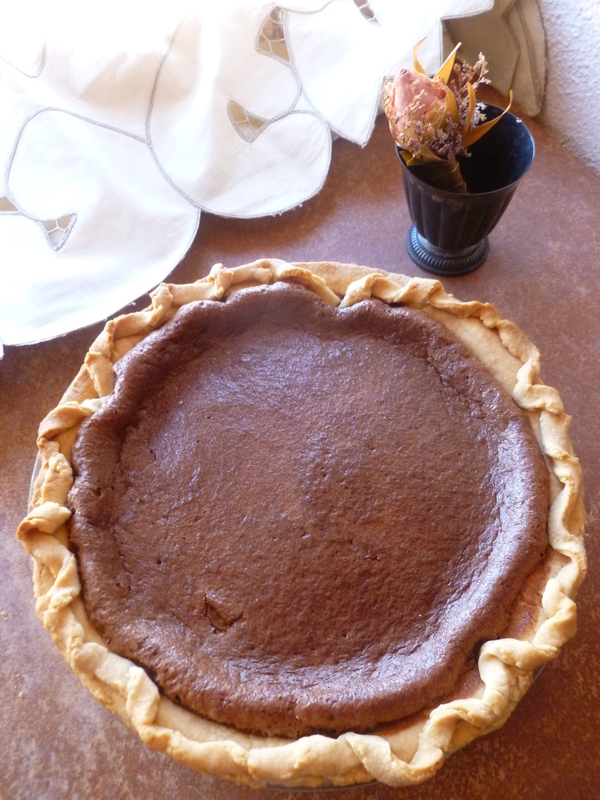 Timing Note: The pie is best when allowed to cool at room temperature and then chilled for at least an hour. If made a day in advance, it will be every bit as good the next day when it is served. 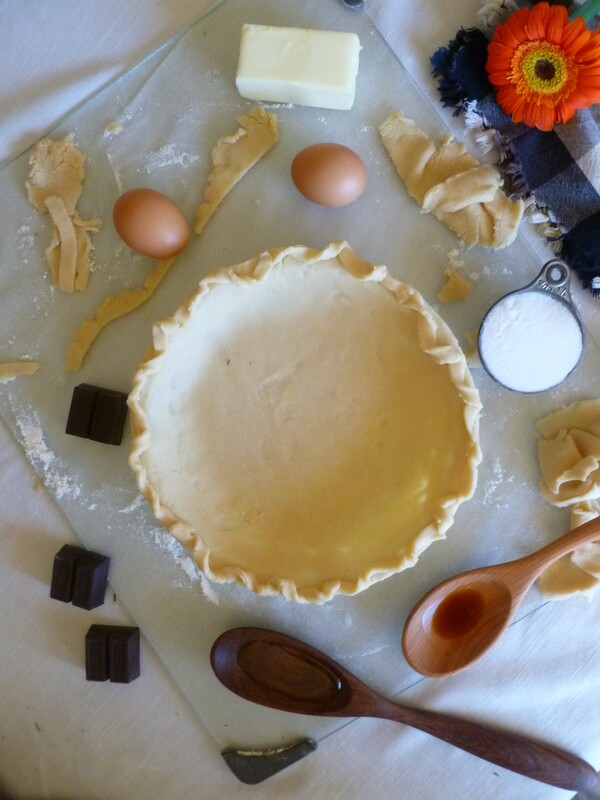 a chilled, unbaked 9-inch Pastry Shell: See Part II below for the recipe. 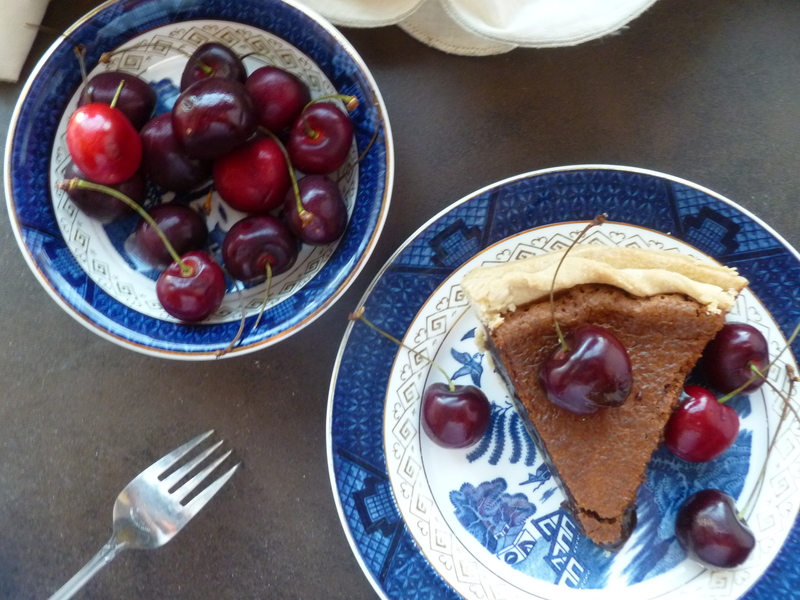 Optional decoration: Fresh dark cherries…if the pie is made in the summer, as it is here for a July 4th dinner, these cherries are in season…in some parts of the world. a Double Boiler or homemade Bain-Marie: The Bain-Marie is made out of a pot partially filled with water and a heatproof bowl that will fit in the rim of the pot without touching its bottom. Ideally, the water in the pot should not touch the bottom of the bowl…but if it does…it will be alright. 2. 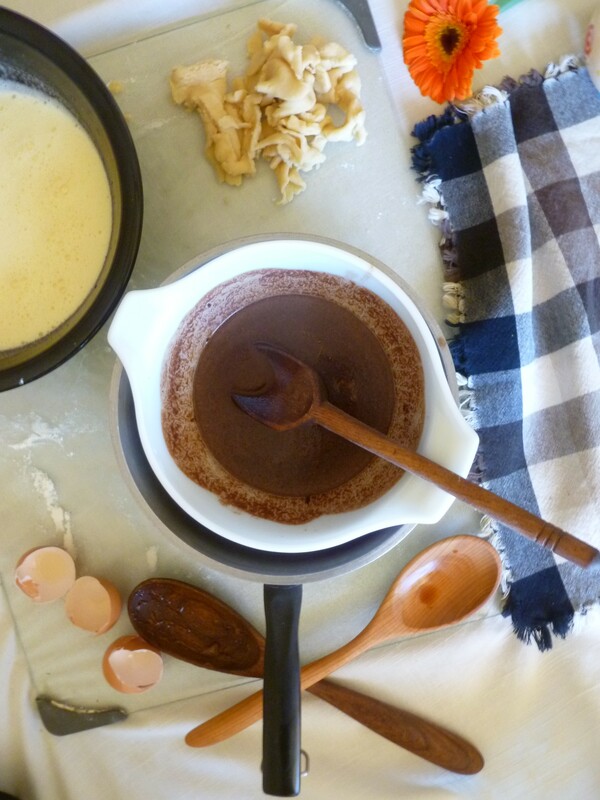 In the top of the double boiler or bowl of the Bain-Marie, melt the butter and chocolate together, stirring. Cool slightly while you mix the other ingredients together. 3. Beat the eggs in the mixing bowl. 4. Add the syrup, sugar, salt and vanilla to the eggs and beat until the mixture is smooth. 5. Add the chocolate mixture and beat again until all is blended well together. 6. 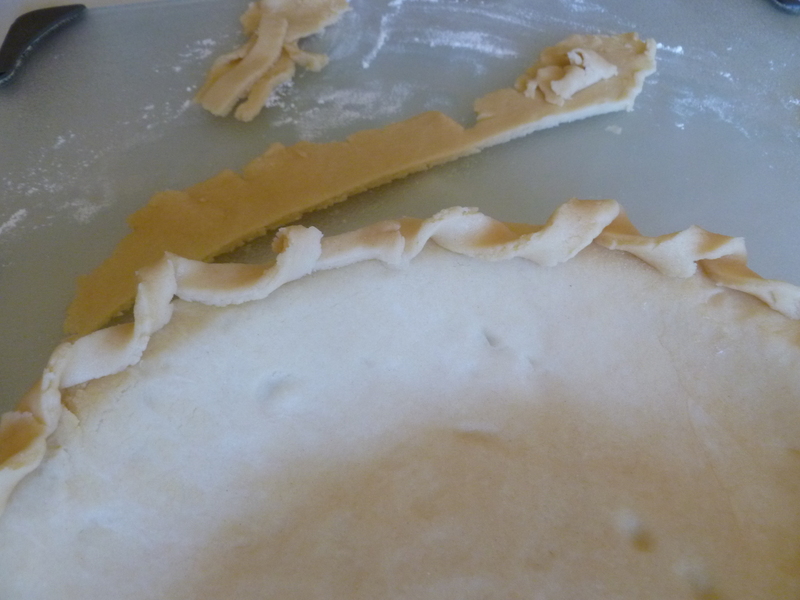 Pour the filling into the chilled pastry shell. Bake at 400 F. for 5 minutes. 7. Reduce the heat to 350 F and bake for 30 minutes more. Remove the pie from the oven. 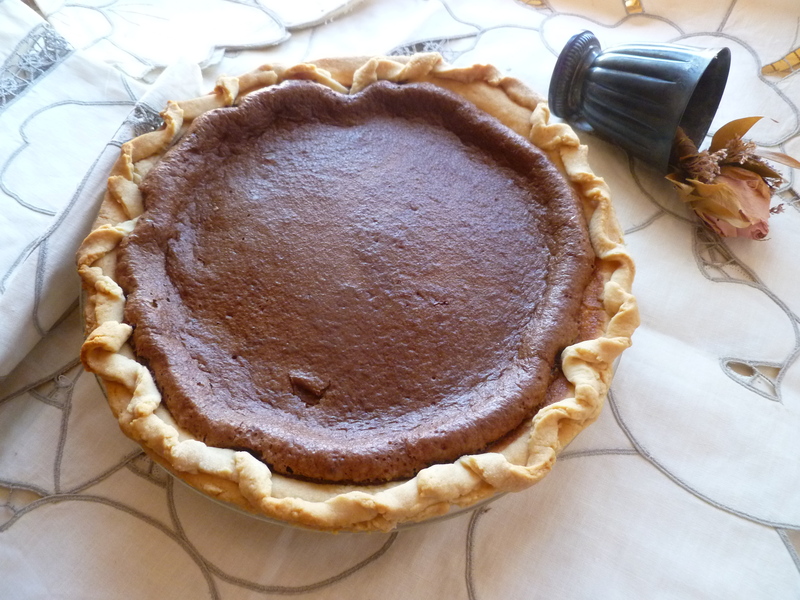 The filling will not be completely firm; it will move a little if the pie is gently shaken. 8. Cool the pie at room temperature. Transfer it to the refrigerator and chill it, covered loosely with a sheet of waxed paper, for at least an hour before cutting and serving. 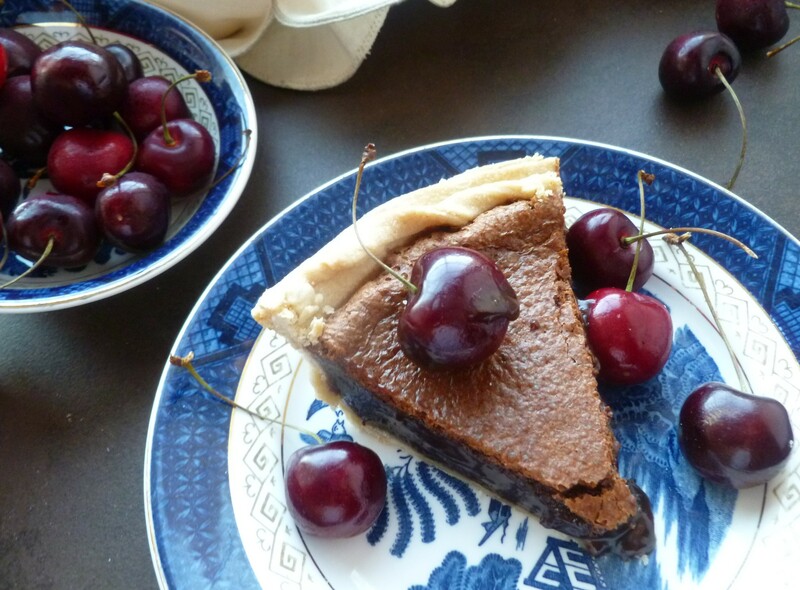 Fresh dark cherries look pretty on the plate with a slice of this pie. a Food Processor fitted with the Rotary Chopping Blade is not essential but is a very convenient way to mix the pastry; it may alternatively be mixed by hand. 3, Flour your hands a little. If the dough is made in the processor, remove the blade, scraping off any pastry that clings to it. 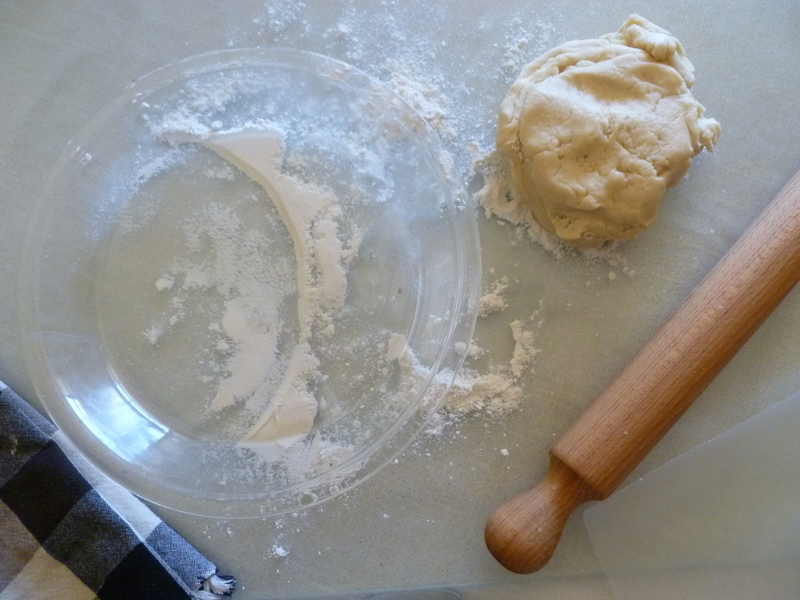 Collect the dough into a ball and turn it out onto a floured pastry board. Sprinkle it with a little flour. 4. The dough rolls out well without first chilling it. But if you do not wish to roll the dough out right away, wrap it in waxed paper and refrigerate it. Chilled pastry made with a combination of vegetable shortening and butter will need to rest for about 5 minutes at room temperature before rolling it out in order for the butter to warm up a bit. 5. Roll out the dough to a size large enough to fit into the pan with a small overhang. 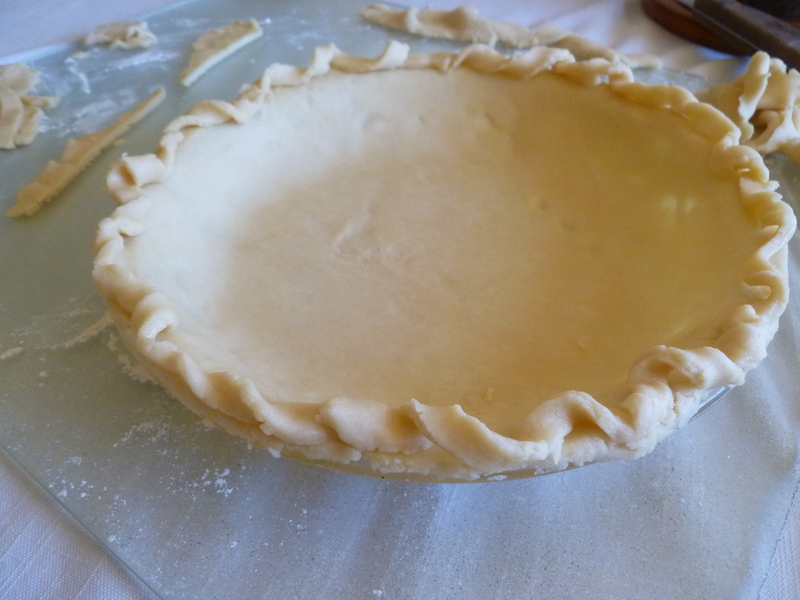 Mold the pastry gently down and around the sides of the pie plate to fit snugly. 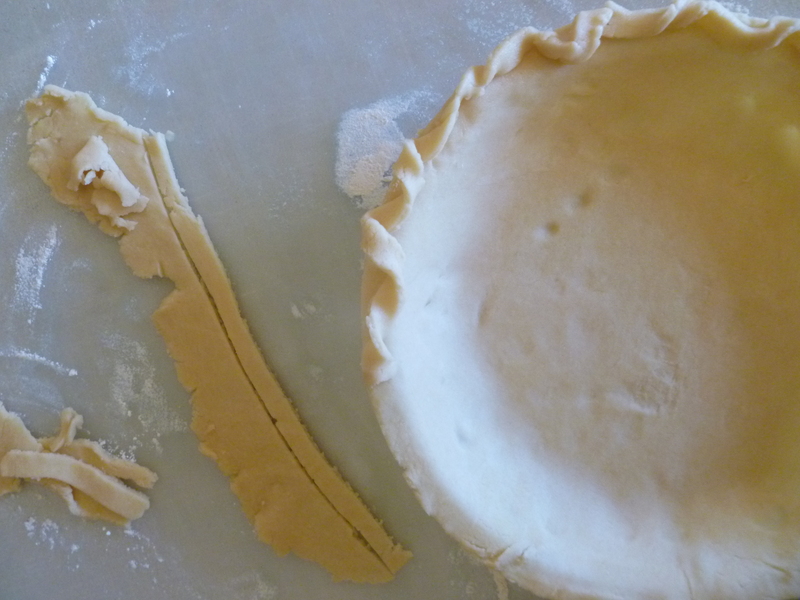 Trim the rim of the pastry even with the outer rim of the pie plate. 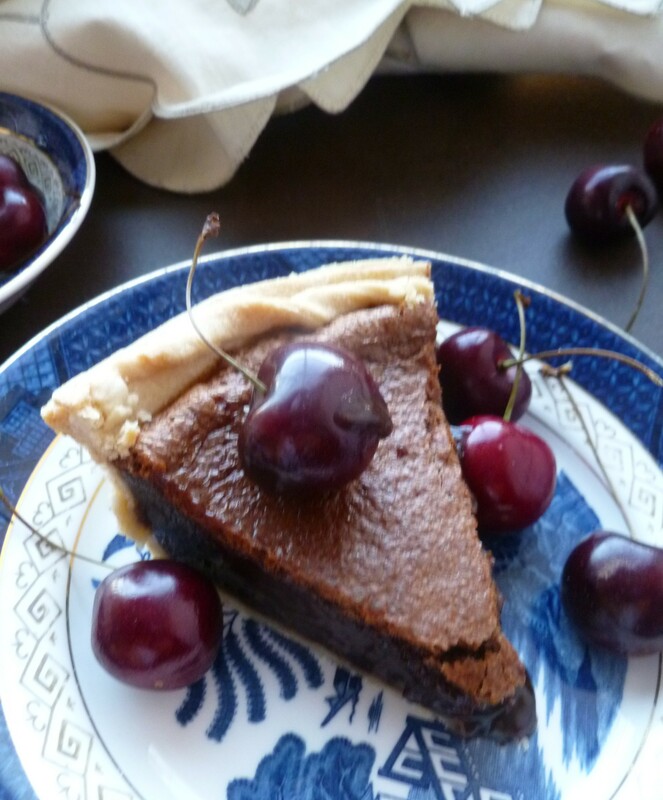 A Note: Devastating Chocolate Fudge Pie is the Dessert for the Dinner Menu: A July 4th Dinner Under the Desert Sky. 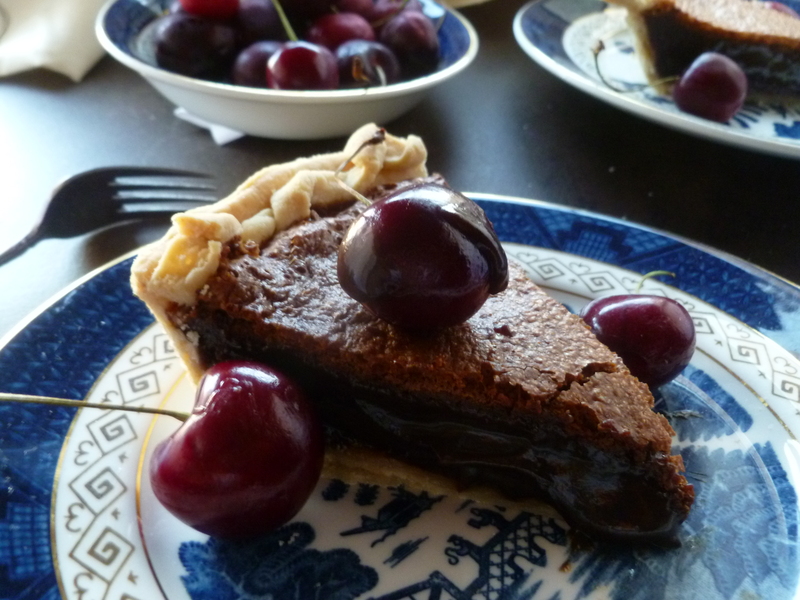 The recipe is adapted from one in Beth Tartan’s excellent The Good Old Days Cookbook (1971). The pie retains the name it bears in Mrs. Tartan’s book. This dessert looks so amazing, great presentation, but in the end it was the caption tha caught my attention. Great post! Wow! That looks so decadent and amazing. Pinned, I’ll be making it sometime! Thanks for posting! ‘Tis so very simple to make,too…I am (sort-of) ashamed to admit that I made two of them in the space of one week 🙂 Btw…I noticed on your blog that you just returned from Nag’s Head…happy to hear you had such a nice vacation…the shrimp with your homemade seasoning brought back good memories of our weeks there, sitting around the picnic table shelling steamed shrimp.